Homecoming 2011 is still five weeks away for the Carey High School football team, entering the season as defending State 1A Division 2 champions. But Friday's home season opener between Carey and the Oakley Hornets had the feel of Idaho football royalty because the kings of Gem State eight-man football for the past five years were squaring off in a rare meeting at Derrick Parke Memorial Field. On a very warm evening, the latest champion, Carey, seemed the hungriest to start off the new season on the right foot. Opportunistic on defense, the Panthers (1-0) scored in every quarter and got touchdowns from five different players in walloping Oakley 38-16. The Carey victory avenged a 44-24 home loss to Oakley in 2007, which was the last time the two teams met. Carey has lost only two of 29 home games since 2006 and one of those was to Oakley. It was the most lopsided loss in five years for Oakley, a decorated grid program with a 46-7 record since 2006 including State 1A Division 1 undefeated championships in 2007 and 2009. Although Oakley suited up 42 players compared to Carey's 19, the Panthers had the swagger that produced state crowns in 2006, 2008 and 2010. Carey junior quarterback Jordan Dilworth (11-for-21, 272 yards) threw three touchdown passes and the Panthers out-gained Oakley 445-318. Three of the five Carey touchdowns came on third-down plays as the Panthers (6-for-10 third-down efficiency) looked sharp on offense and executed well. Dilworth threw 55-, 25- and 72-yard scoring passes to Baley Barg, Jack Cenarrusa and Charlie Rivera. Chance Chavez scooted around end for a 25-yard TD run. Carey's defense led by Jack Cenarussa and Charlie Rivera (12 tackles apiece) made big plays when needed, and the Panthers had four sacks and an interception. Lane Kirkland, the 11th-year Carey coach who started his teaching and coaching career at Oakley in 1998-99, said, "Our defense did a great job. They really swarmed and brought the pressure. "Oakley is a very decent team. I was surprised at how good their line was. Our line stepped up and shut down the fastest player in 1A football (Oakley senior wingback Stephan Ortiz). A good player always gets his one touchdown—Ortiz got his early on a long run—then Oakley had to earn their second and final touchdown in the fourth quarter. Holding them that way is the sign of a good defense. "I think we wore them down. Our kids are in good shape. I think we could have played another quarter, even the big guys. The coaching staff felt good about that." The non-conference game could have gone either way in the early going, but Oakley (8 penalties for 52 yards) hurt itself with poor execution from the opening drive. After the Hornet defense stopped Carey cold on its first possession, an Oakley personal foul on the fourth-down Carey punt attempt gave the Panthers another chance. On his first pass as the varsity starter, Dilworth connected with senior Barg for four yards on a quick out. The next play to the left side looked very similar, although this time Barg faked to the sideline and went long. Dilworth led him perfectly for a 55-yard scoring strike. Rivera followed Dilworth's lead block around the left end for the two-point conversion and Carey led 8-0 three minutes into it. Wearing jersey No. 13, Oakley's Ortiz made his own luck with a 70-yard scoring run on a counter—the second Hornet play. It was the only time Ortiz (15 carries for 104 yards) really slipped away. Carey's defense limited him to 34 yards on 14 carries thereafter. Carey didn't score on its second possession (interception) or its third drive (a 5-minute, 12-play drive that got as far as Oakley's 12). But the Panther defense that held Oakley to negative yardage on 11 of 40 Hornet running plays really came up big—Chavez (9 tackles) nailing senior Eleazar Tellez for a two-yard loss on a counter, and defensive end Dillon Cenarrusa crushing Tellez for a seven-yard loss on a 3rd-and-4 reverse. A poor punt snap and a rushed Hornet punt gave Carey possession at the Oakley 25. On Carey's first play from there, Chavez carried a pitch around right end for a 25-yard TD scamper, and Dilworth passed to Rivera for the two-point conversion and a 16-8 Panther lead at halftime. The Hornets (120 rushing yards before half) had attempted only two passes in the first half. After a 33-yard Ortiz kickoff return was nullified by an illegal block, Oakley put up its first pass of the second half, on 3rd-and-10. Barg intercepted the Jamison Jones aerial and returned the ball 10 yards to the Hornet 22. On 3rd-and-13, Carey got lucky when it put two pass receivers in the same general vicinity for Dilworth's throw across the middle. Jack Cenarrusa caught the ball and finished the 25-yard scoring play. Dilworth's conversion run stretched Carey's lead to 24-8. With 21 minutes remaining and only two touchdowns separating the two teams, the game was far from over, as Carey coaches Kirkland, Lee Cook and Lane Durtschi reminded the Panthers. 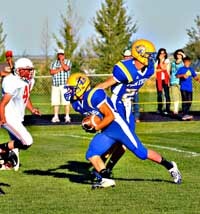 Oakley's Ortiz returned the subsequent kickoff 28 yards into Carey territory before Dillon Cenarrusa brought him down. On fourth down at the Panther 36, Jack Cenarrusa's terrific open field tackle on a keeper by Hornet QB Jones gave the ball back to Carey. Carey's offense put together an eight-play, 62-yard scoring drive highlighted by a 15-yard pass completion from Dilworth to Jack Cenarrusa. Dilworth's six-yard scoring run up the gut made it 30-8. Kirkland said, "I thought our offensive line (juniors Garrett Lee, center Francisco Gamino and Glen Andrews) started to dominate the line of scrimmage. Our big guys went to work and communicated with each other very well." The final Panther score was a thing of beauty—Charlie Rivera (4 catches, 128 yards) taking a little swing pass from Dilworth and twice hopping over potential Hornet tacklers on a 72-yard run. Next up: Carey clashes with its second of three straight 1A Division 1 rivals during a Labor Day weekend trip to Malta for a game against the Raft River Trojans (0-1) Friday, Sept. 2 at 7 p.m.
Coach Kirkland expects Raft River, a 46-22 home loser to Castleford last Friday, to be much improved from last fall's 1-8 campaign that was an aberration for a normally tough Trojan program (39-11 from 2005-09). Raft River started 2010 with a 50-0 loss at Carey and it got worse from there—only a 22-16 win over North Gem for coach Randy Spaeth's 100th coaching win providing some solace. The Panthers last played football at Malta in 2006, losing 26-12 to Raft River in that game. Rushing—Chance Chavez 9-53, 1 1st, 1 TD, 1 conv. ; Jordan Dilworth 12-49, 3 1sts, 1 TD, 2 conv. ; Charlie Rivera 11-35, 2 1sts, 1 conv. ; Baley Barg 1-2. Passing—Jordan Dilworth 11-21, 272 yards, 5 1sts, 3 TD, 1 conv., 1 interception. Receiving—Baley Barg 4-104, 2 1sts, 1 TD; Charlie Rivera 4-128, 2 1sts, 1 TD, 1 conv. ; Jack Cenarrusa 2-40, 1 1st, 1 TD; Chance Chavez 1-0. Fumble recoveries (1)—Dillon Cenarrusa 1. Interceptions (1)—Baley Barg 1 with a 10-yard return. Sacks (4)—Glen Andrews 2-18; Dillon Cenarrusa 2-21. Kickoff returns—Jack Cenarrusa 2-39; Chance Chavez 1-0. All-purpose yardage—Jordan Dilworth 321; Charlie Rivera 163. Tackles (61)—Jack Cenarrusa 12, Charlie Rivera 12, Chance Chavez 9, Baley Barg 7, Dillon Cenarrusa 6, Garrett Lee 5, Glen Andrews 4, Francisco Gamino 4, Jordan Dilworth 2. Rushing—Stephan Ortiz 15-104, 1 TD; Eleazar Tellez 15-46, 2 1sts; Jamison Jones 5-25, 2 1sts, 1 conv. ; Tyler Andrew 3-3; Brodie Bell 1-9, 1 1st; Matt Setoki 1, -1. Passing—Jamison Jones 8-14, 82 yards, 3 1sts, 1 TD, 1 conv. Receiving—T.J. Andersen 4-46, 1 1st, 1 conv. ; Brodie Bell 2-21, 1 1st, 1 TD; Tyler Andersen 2-15, 1 1st. Fumble recoveries (2)—Tyler Andrew 2 with 10 yards in returns. All-purpose yardage—Stephan Ortiz 155; Jamison Jones 107. Tackle leaders—Tyler Andrew 10, Stephan Ortiz 6, Jose Contreras 7, Tyler Andersen 4, Jake Mitton 2, Eleazar Tellez 2, Derek Adams 2.